So, well! Summer is still here and we all need refreshing summer drinks to quench our thirst and freshen our minds. Usually we look for new recipes and forget about the ingredients we already have. I thought instead of a new recipe why not round up a few summer drink recipes from our Stagetecture collection and help you beat the summer with full energy and vigor. Believe me there are so many out there and you would love to rediscover them. So here is my pick of the top 5. Pink Cadillac Margaritas, finds its place in top 5 because of its great mix of citrus flavors with that of alcohol. Citrus defines summer perfectly and well alcohol brings in a depth to any drink. Enjoy this gorgeous Mexican summer drink with friends and family and make it a part of your beautiful summer evenings! Now this one is a perfect party recipe! The ingredients and simple and readily available and the resultant summer cocktail is a refreshing and soothing one. Lime blends terrifically with tequila and believe me you can really impress that someone special with your culinary skills this summer. Just whip up the Lime & Sorbet Margarita! The Food Network has 50 Summer Drink Ideas you have to see. This one is for all those kids who cannot yet take a sip into alcohol based recipes. Frothy Strawberry Milkshake, brings the goodness of milk, yumminess of strawberries and the freshness of cold vanilla ice-cream. Dear kids this is the ultimate thirst quencher and energy revitalizer this summer! Our Delicious Drinks Pinterest Board has more great milkshakes, smoothies and cocktail recipes. With a great flavor of herbs & fruits and a punch of vodka, the Blackberry Crush & Watermelon Cocktail forms a great summer drink. It is the kinds that you can serve at summer weddings and grander parties. Your guests will be asking you for more so cater for it. Liquor.com has all of the cocktail recipes you could wish for. A Watermelon Granita, is a wonderful thing. I say ‘thing’ because it is a dessert as well as a drink! So I don’t know where to really put it! Watermelon combines beautifully with lime, sugar and ice to form a mouthwatering dessert drink that you just have enough of! This recipe roundup was an interesting thing to do as it made me relive the great recipes here at Stagetecture. The best part about these summer drinks is the fact that the ingredients are the readily available summer fruits and herbs, that add a beautiful seasonal flare to these recipes. 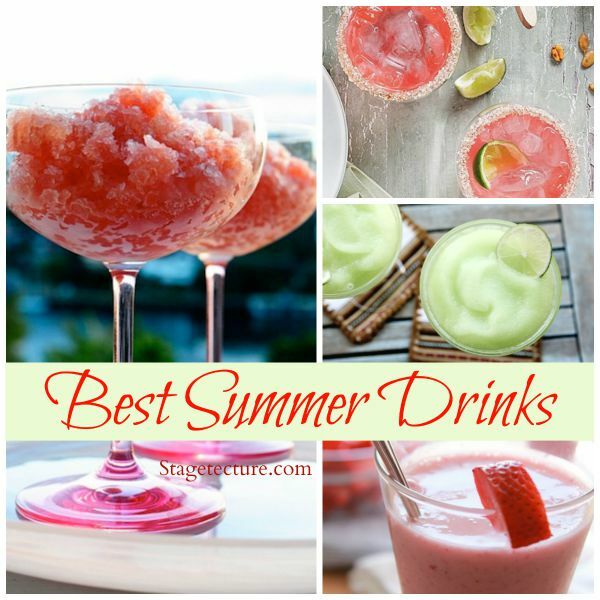 So go enjoy these summer drinks and let us know what you thought about this Recipe Roundup post! Click here for more summer cocktails on Stagetecture!